In collaboration with AHA, Nā Hawai‘i ‘Imi Loa (NHIL) hosted a free archival training workshop for students and non-profit organizations. 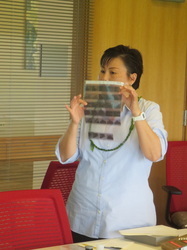 The workshop was held at the University of Hawai‘i West O‘ahu’s (UHWO) library on Saturday, September 22nd. The focus of this workshop was on introducing basic archival practices – including minimal level processing, basic arrangement, and description – to individuals and organizations who might not otherwise be given the opportunity to receive this type of training. 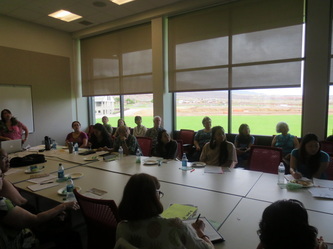 After a guided tour of the brand new UHWO campus, graciously provided by Kalowena Komeiji, Communications Director at UHWO, participants enjoyed some snacks and jumped right into introductions – of workshop presenters and attendees. Attendees included staff and volunteers from Kokua Kalihi Valley, Palama Settlement, Hawaii Literacy, Japanese Cultural Center of Hawai‘i, Linapuni Elementary School, Leeward Community College, University of Hawai‘i at Manoa’s College of Education, Kamakakūokalani Center for Hawaiian Studies Resource Center, as well as current UHM students in Music, History, Hawaiian Language, and Library and Information Science. After introductions, NHIL volunteers explained the importance of archives and preserving records, then AHA volunteer, Gina Vergara-Bautista, presented five steps to archiving organizational records. Following this, participants engaged in breakout sessions during which our wonderful AHA volunteers covered best archival practices in six major areas: oversize materials, artifacts, photographic prints, electronic records, paper, and film. Keeping in mind that many workshop attendees may work at organizations which run on shoestring budgets, archivists leading each session provided tips and alternatives to reduce costs. Examples of this included using acid free printer paper or zip lock bags to store certain items, and how to make a scrapbook using archival materials on a budget – DIY (do it yourself) advice archives style! On behalf of Nā Hawai‘i ‘Imi Loa, we would like to mahalo the awesome AHA members that took time out of their busy schedules to plan and present at our first archival training community workshop! This event truly could not have been such a great success without their help. We hope to continue to collaborate with the AHA members who contributed to this workshop and hope others will be inspired to join in on the fun as well!